This may not be unusual for most of you. But sadly for me, this is a rare occurrence. While cooking Pinoy dishes should come naturally to anyone raised in these tropical isles, I have been amiss in learning to cook the good eats of my native land. Don’t get me wrong. I love Filipino food with a passion. Because of my mother and a series of amazing cooks my family has had the honor of employing, I have been spoiled. Over the years, these women have created Pinoy dishes that could make grown men weep, yearning for a warm, home-cooked meal. In the end, I decided why screw around with perfection? This year, I’ve decided that it’s time to learn, not only how to cook Filipino food but also to understand and appreciate why our food is so unique among other Asian cuisines. 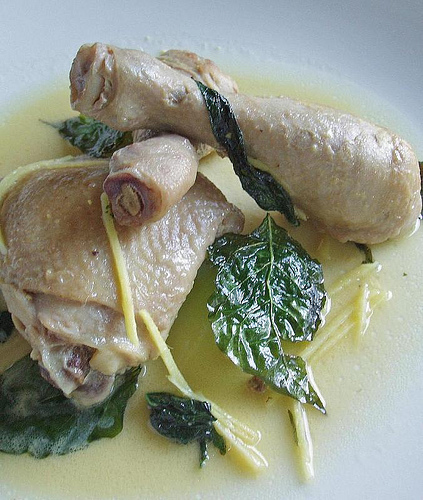 I found the Pinatisang Manok or Chicken stewed in Fish Sauce to be an unusual dish. As mentioned by my cookbook du jour, Kulinarya, fish sauce, or more commonly known as patis, is usually not used as a main ingredient. More often it is used as a condiment more than a primary flavoring. But because this recipe combines two things that I love, chicken and fish sauce, I decided to give this recipe a go. The end result is a light chicken stew that is both warm and comforting because of the high quality fish sauce and the subtle flavor of the mashed egg yolk. The broth has a surprising depth of flavor. With a bowl of steaming hot rice, this dish makes the perfect meal especially in the oddly cold weather we been having lately. Just a quick note. The authors of Kulinarya emphasized the importance of using the best fish sauce possible. In a wok, heat the oil over medium high heat, until it begins to shimmer. Add the ginger and saute until fragrant. Add the chicken pieces and half the fish sauce. Turn up the heat to high and cook the chicken to a golden brown. Reserve a little of the chicken broth and pour in the rest in the wok. Bring the broth to a boil. Lower the heat and simmer for 2o minutes or until the chicken is tender. In a small mixing bowl, mash the egg yolk and add the reserved chicken broth. Once the mixture achieves a paste-like consistency, add it to the cooking chicken broth. Remove the chicken from the heat and add the chili leaves. Taste the broth and add the remaining fish sauce if deemed necessary. Love this! I discovered the "cooking method" of Pinatisan when I was working for a company that manufactures some of the best Pinoy condiments, including Patis. You'll be surprised at how yummy Pinatisan is even with beef and veggies. Remind me to share a recipe with you one of these days. Pininyahang Manok One of the all-time favorite Filipino disehs is the Pininyahang Manok which was cooked using chicken and pineapple as the main ingredients. Adding the secondary ingredients such as carrots, bell pepper, and evaporated or fresh milk to make-up the dish .